Since its debut in 2013 as a winter counterpart to Mona’s summer festival, Mona Foma, Dark Mofo has grown to become one of the most important fixtures of Australia’s cultural calendar. But over in the Huon Valley, 40 minutes south-west of Hobart, there’s another mid-winter festival that can also lay claim to the ‘weird and wonderful’ trope typically ascribed to Dark Mofo. Held in July at Willie Smith’s Apple Shed – a cider house, cafe, museum and live music venue housed in a rustic barn on the outskirts of Huonville – the Huon Valley Mid-Winter Festival is a pagan-inspired celebration of the region’s apple-growing history (the Huon Valley is at the heart of the state’s famous apple industry). In wintertime the Huon Valley is cold, dark and foggy, and its agricultural community is prone to a little sleepiness. In a bid to ‘wake up winter’, and let outsiders know that the region is open for business, Willie Smith’s co-owner and Huon Valley Mid-Winter Festival director Sam Reid looked to another climatically similar, cider-making region for inspiration: the West Country of England. In 2014, a festival of feasting, cider, fire and folklore was born. The festival’s central focus is Saturday night’s wassail, an ancient tradition still celebrated in the West Country that involves waking up the dormant apple trees in hope of a good season ahead. “We bring together Morris dancers from all over Australia to lead us in the wassail, where we chant incantations, bang pots and pans, yell and scream and shoot shotguns through the trees to scare away the nasties and wake up the trees,” says Reid. 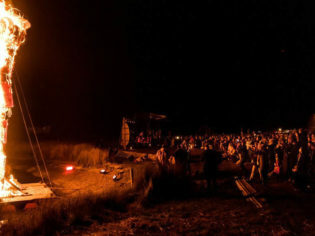 Opening the festival on the Friday night is an Indigenous Welcome Ceremony produced by the team behind Bruny Island’s Nayri Niara Good Spirit Festival and incorporating the burning of a 13-metre-tall effigy. “Other elements you can experience at the festival are quirky folk musicians, some of the region’s finest food and beverage presented by local producers, the ancient art of storytelling, a local artisan market, buskers and street performers,” Reid continues. So much pagan pageantry wouldn’t be complete without quirky costumes to match. Dressing up in traditional outfits – including ‘tatters’, which are topped off with painted faces and top hats and were worn by Welsh border Morris dancers as far back as the 1500s – festivalgoers really go to town. Cue feathers, fur, leather, greenery and even antlers, plus prizes for the best dressed. Transplant The Wicker Man to the wilds of Tasmania and you start to get the picture. Sung to all the apple trees and drunk all the cider you can at the Mid-Winter Festival? Sam Reid gives us his recommendations for other things to do in the Huon Valley come wintertime.